Yesterday in the afternooon, I solicited prayers for my latest undertaking -- a perm rod set with the big, brown jumbo rollers. Y'all might have thought I was just joshing around, but I seriously needed my prayer warriors to surround me on this one. 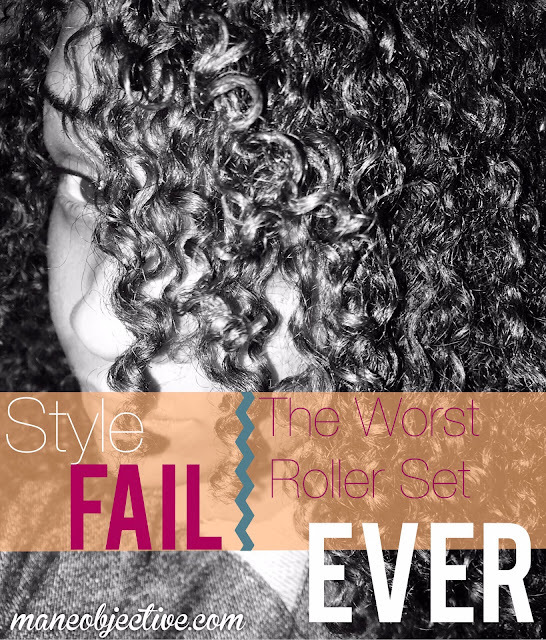 If you've been following me on the blog, Instagram, Facebook, YouTube, and Pinterest, then you know that I don't dabble too deeply into styling my natural hair. I experimented much more with styles during my transition, because my hair wasn't wash and go ready. But as soon as these curls began to pop...that's all she wrote. I'm sure many of you guys are bored with my endless quest for curl definers, and I'll admit that sometimes I get tired of them too. 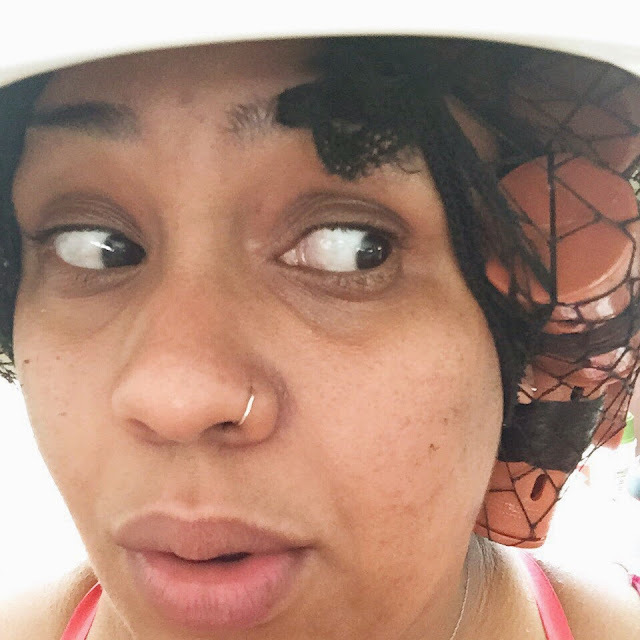 So after I posed the question on social media asking whether to do perm rods, Curlformers, or a braid-out, I tallied the responses: perm rods came in first, followed by Curlformers, and then a braid-out. Even though my perm rod set was a total fail, I am determined to move forward with different styles. 1. Cowashing with Trader Joe's Tea Tree Tingle Conditioner. This has become my in-between shampoo staple. 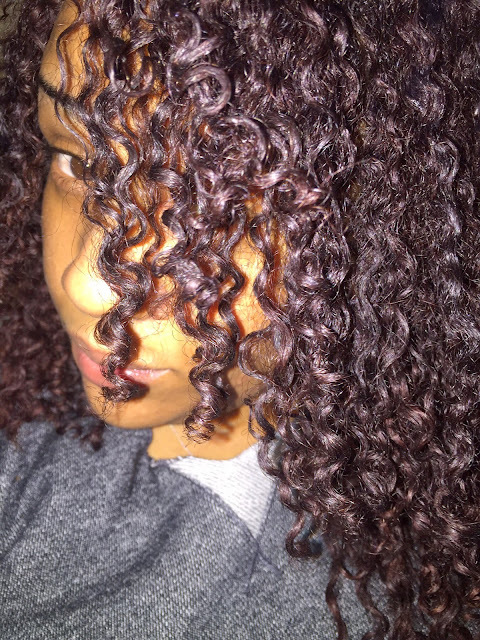 It cleanses, it detangles, it tingles, it is low-key my everything. 4. Apply product to my hair like there was no tomorrow. I sprayed LRC all over my head, but didn't overdo it. Where I went super extra mega ham was with the Hello Curly -- I like, applied that stuff in sections like there was no tomorrow. The sad part is, in the back of my mind I knew better. 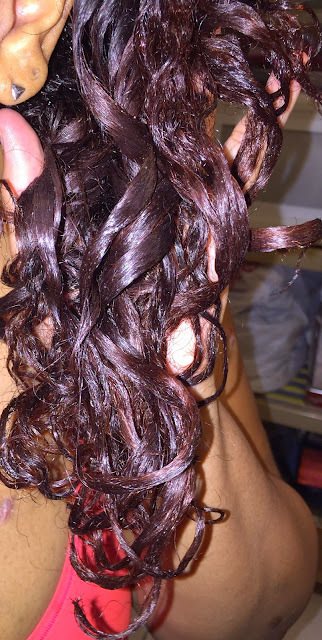 I know how potent Hello Curly Curl Stimulator is, yet I forged ahead with reckless abandon. I literally applied one or two pumps per section of hair for each roller. 5. Struggle like hell to roll my hair. Between the oversaturated slip of the gel and the fact that I didn't know what I was doing, it was incredibly difficult to get my hair on the roller, keep it on the roller, and fasten it taut against my scalp. I can't tell you how many times I thought I had it on right and then as soon as I let go, the roller unrolled halfway down my hair. I almost quit, I really did. But I forged ahead for y'all. 6. After struggling with rollerrs for about an hour, I sat under my hooded dryer for an hour to begin the drying process. I honestly got nervous under there. I could literally hear some of the elastic bands snapping from the rollers. I'm not sure if it was their cheap construction (ahem, Annie brand) that cause them to surrender under the hooded heat, or the slip of the gel rendered their construction useless. The only thing that quasi held it together under there was my net. 7. Where I likely ran into even more problems was the fact that I could only be under the dryer for an hour. I had to get cooking, so I spent the next 3 hours cleaning up and air drying. By about 6:45 I had had enough of the rollers and refused to let Samuel walk through the door seeing me look like somebody's Auntie Wanda. So I took the rollers out, laughed at how terrible my hair looked, pinned the front back, and acted like I meant to do it. By the end of the night, I had about 15 different jokes for how terrible my hair looked. I was trying to reconcile the fact that it was shinier than a new penny, crunchier than a Cooler Ranch Dorito, and yet sticky. It was wavy, straight, and curly at the same time. It looked horrible -- and there was absolutely no redeeming quality or justification for how my hair looked such a mess after 5 hours of work and drying. I came to the conclusion that my hair looked like a heat damaged version of itself, circa early 2012. No, that picture isn't from 2012. It's from last night. 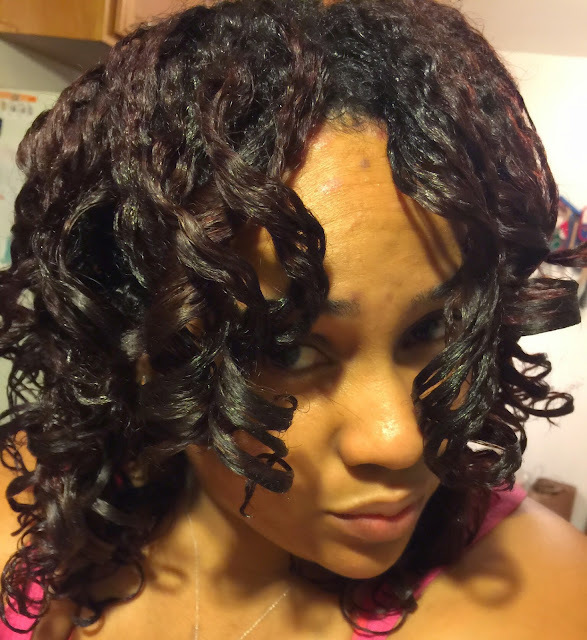 Click here to see my second look review of Jelly Soft Curls. Oh, and I need to finalize my review on the as I Am Leave-In Conditioner, too. Check for those soon! Have you ever completely, totally, and utterly FAILED at a style that everyone does with ease? Share your experience below so I don't feel so bad! I was under the impression that I had it all under control when i began this look and i must have made the same exact mistake because i had the same exact problems lol. The rollers kept slipping and sliding, they began popping out and my finished product was word for word the same as yours. A waste of about 5 hours smh... Glad im not alone in this #epicfail! Bantu knots. Every. Time. A complete fail. will u be re attempting this style? I've done 2 successful bantu knot outs in my life. Both were as a transitioner. Those things are entirely too painful to sleep in. I feel so much better knowing I'm not alone. I heard bands popping and I started looking up like uhhhhh.... #JesusTakeTheWheel. Definitely need to re-group and re-strategize around this one...or just leave it alone lol. Lol. Let me pray about it first... I'll probably do it again with the Jane Carter. EVERYONE told me to get Jane Carter, and I didn't listen. That's what I get for being hard headed, lol. More than likely in about a month or so. I think I may need to just buy a head from the beauty supply store and practice, lol. Probably get smaller rollers and that Jane Carter everyone's telling me to buy. I'm going to YouTube University for this one, lol! LMAO really?? Well, don't feel bad. At least you planned your time accordingly so you didn't have to stroll out the house with it. I didn't the first time I tried a wash and go with a new product. Live and learn!! 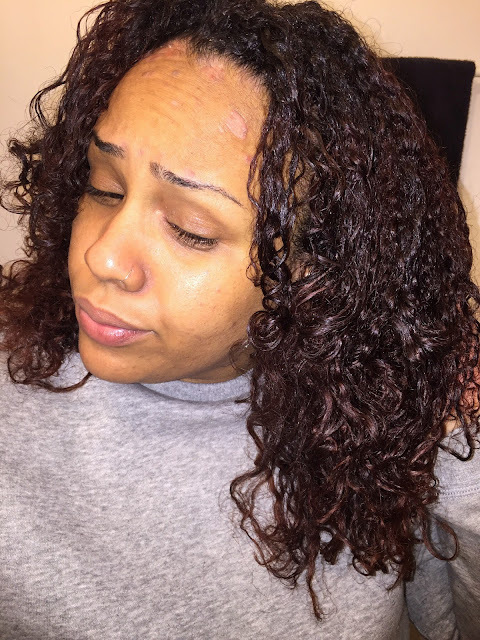 The twist outs are my enemy!!!!! The ends always get frizz! I just can't get it right on dry or wet hair. My husband trys to put on a brave face but I know it looks like a hot mess. So I just end up brushing it out to a fro. But I will not give up the fight! Thanks you for sharing this, Its really helpful! Thanks so much for sharing! I love your curls and hair color! Good quality post and comments, thanks everyone. It's cool that you write such things.